Considering getting a Coton De Tulear? Coton de Tulear is a small toy dog breed that weighs 12 to 15 pounds and stands 25 to 30 centimetres. It's a clownish and happy-go-lucky dog with a soft cotton-like coat that comes in white, black and tricolours. Cotons can live as long as 16 years if cared for properly. Its origins are not clear, but one thing is sure, this dog breed came to Madagascar Island and was bred with local terrier-type dogs. The United Kennel Club recognised Coton de Tulear breed in 1970. Are you looking for a Coton de Tulear? Here is a brief background to this adorable toy dog with a coat as soft as cotton. Stories about how the Coton de Tulear came to be in Madagascar Island is quite unclear. Some theories claim that the original breed (Cotons de Reunion) swam to the shores of Madagascar after a shipwreck, while others suggest that they were deliberately brought to Madagascar and bred to local terrier-type dogs to develop today's Coton de Tulear. This dog breed was heavily guarded by the Merina tribe in Madagascar from the 17th century, meaning no Coton was to be removed from the island. Later, Coton de Tulear is to be seen with Nobles and French Royalty. How this was possible is unknown, but it is assumed that a few select people were permitted to leave the island with a Coton de Tulear. The breed was accepted and recognised in 1970 by the United Kennel Club. The Coton de Tulear is a rare breed and remains to be in limited numbers up to this day. Being a small dog in the toy group, the Coton de Tulear weighs between 12 to 15 pounds and stands at 25 to 30 centimetres. Its distinct long and cotton-like fluffy coat is the obvious reason for its French name, Coton. The Coton de Tulear has soft hair (not fur) comparable to a cotton ball, distinguished black nose, large and round expressive eyes, and a short face. It closely resembles the Bichon Frise and Maltese. To further emphasise its distinguishing feature, the Coton de Tulear has a coat that is thick and soft and described to be of fluffy and cottony texture. The coat comes in three accepted colours such as white, black and white, and tricolour. Coats may have a few shadings from light grey to red-roan on the ears. Cotons shed minimally and are highly recommended for people with allergies as its soft and cotton-like fur is hypoallergenic. Make sure to remove matted hair through daily brushing and combing. The challenge in grooming a Coton de Tulear comes with its its doggie smell, which can be removed with a proper bath and grooming. You may bathe a Coton weekly or every two weeks, depending on how dirty and smelly it gets. Aside from keeping its coat's pristine look, do not forget other aspects of grooming. Brush the teeth of a Coton at least twice or thrice a week to remove tartar and build-up of bacteria. Of course, nothing beats daily brushing if manageable. Its nails must also be trimmed at least twice a month. Ears must be cleaned to avoid infection, which is characterised by redness and tenderness. If you notice any certain abnormalities, don't hesitate to consult your veterinarian. The Coton de Tulear is what you describe as a happy-go-lucky dog breed. It is playful, and while generally quiet, it can often be vocal (grunting and barking) when having fun. Those videos you see of small white dogs jumping and walking on their hind legs are most likely a Coton. These dogs are people-pleasers, which makes training a breeze. Cotons are also curious and will welcome any new people you introduce so getting a Coton to be a guard dog is a mistake. Cotons are specifically bred to be companion dogs, which they are exceptionally good at doing. Cotons enjoy being around children and love playing interactive games. This makes them ideal pets for families with young children. However, it is best to supervise playtime to make sure neither the children nor the dog gets hurt by accident. When it comes to interaction with other pets, there is no need to worry. Cotons are social butterflies and are known to enjoy the company of cats, which is unusual for a small dog. A typical serving of an adult Coton de Tulear is 3/4 cup of premium dog food daily. Make sure that you don't serve it in one large meal. It is recommended to feed dogs twice a day (morning and evening) to avoid bloating. One thing to remember in feeding a Coton puppy is to choose food that is grain-free and high in protein such as lamb, chicken, turkey, beef, or bison. Avoid food with cheap fillers, artificial flavours and sweeteners. The Coton de Tulear has a lifespan of 14 to 16 years given the proper care. As with any breed, Cotons are also predisposed to some health conditions. These health conditions include Joint problems, Spine issues, Legg-Calve-Perthes disease, Urinary infections, Urinary stones, Diabetes, and Bandera's syndrome. Cotons are active and intelligent dogs and like all dogs must be given adequate exercise daily. They need at least 30 minutes of exercise per day and will be more than happy to be outside and play. This little fluffy dog when off leash can be quite the escape artist, so make sure that your back garden is securely fenced. Are you willing to be on a waiting list? 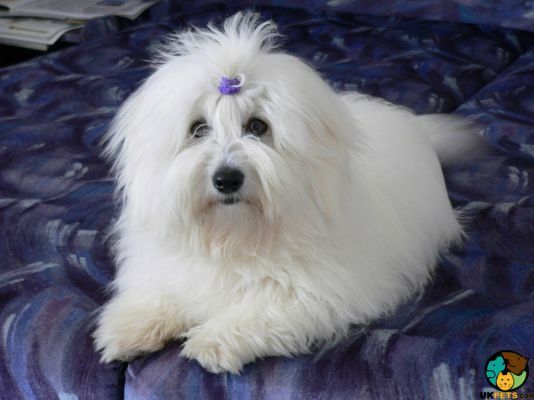 The Coton de Tulear dog breed is rare. In fact, only a few puppies are bred and registered each year. And if you are quite lucky to be on the waitlist, you have to prepare at least £1,000 for a well-bred puppy. Once you've brought home your Coton puppy, don't forget to get a pet insurance for this breed. The cost to insure a Coton is anywhere from £20 to £40 a month. Veterinary consultations is a must do if you want to make sure your Coton is healthy. The annual cost to bring a Coton to a veterinarian is £800. Don't fret, this estimate includes initial vaccinations, annual booster and spaying so the following years may not be as expensive. The cost to buy premium dog food must also be factored into your budget. Food for a small breed like the Coton will cost around £20 to £30. Is a Coton De Tulear Right for You? The Coton de Tulear is a small toy dog bred for companionship. Cotons are the social butterflies of the dog world; they're friends with everyone. They have cotton-like coats that are hypoallergenic. Cotons are happy-go-lucky and love to bark when having fun. They are people pleasers, so they are easy to train. Cotons can live up to 16 years.